What’s the best time to visit Hawaii? Wondering when to go - in 2019, or soon after? Honestly, in our opinion - there isn't an inopportune time to go to Hawaii. Visiting Hawaii is a dream come true for many visitors, and who can blame them? The weather is fantastic nearly year-round, there's something to do for everyone, the food is phenomenal (try laulau, trust us! ), and 2019 is looking like a great year to visit. If you're considering visiting Hawaii in the coming months, then we've got you covered with the latest on each island's conditions, general weather expectations, our expected visitor demand, visitor trends, and much more. When are periods of High and Low Demand? To assist visitors with visualizing the periods of high and low demand in Hawaii, we've created the following 2019 Hawaii Demand Forecast. 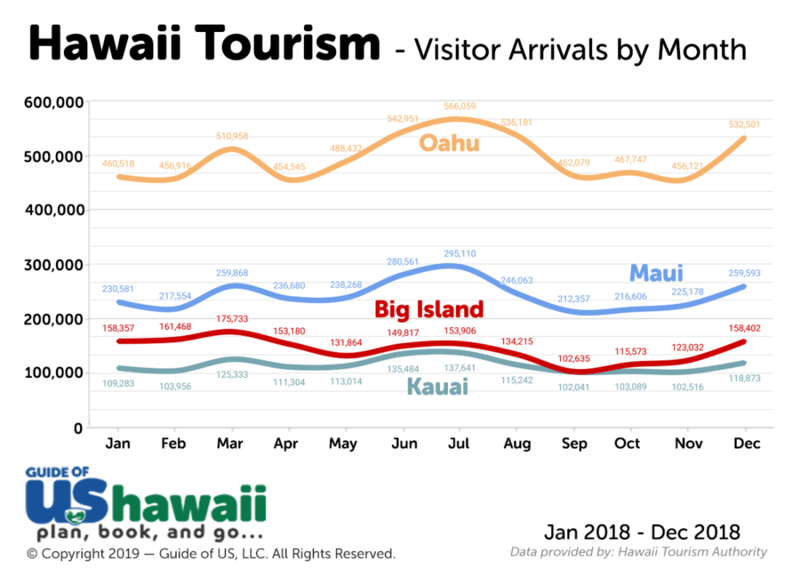 This is an approximate overview of when we expect Hawaii to see increased travel in 2019, based on travel trends in Hawaii over the last three years. There's good news emerging for visitors looking to travel by air in 2019. Due to increased competition amongst air carriers and new direct flights into Hawaii (i.e. ; Southwest Airlines) - 2019 is shaping up to be one of the most affordable years to fly to Hawaii in recent memory. Visitors should definitely take advantage of the low fares and, as always, definitely consider visiting multiple islands if time permits while on your trip. Don't listen to the Weather Channel or watch the NOAA forecast graphs, of course, they'll predict rain - it technically rains almost every day in Hawaii... for about 10 minutes at a time. The only time it's really wet in Hawaii for a prolonged time is during the winter months, usually from November until March. But it's not a wash by any means. Temperatures at sea level usually run about 76-85 °F (24-29 °C) all year-round. Temperatures at night are typically 12-18 °F (3-4 °C) cooler, but this can change dramatically depending on your altitude. Speaking of altitude, if you're planning to go up to higher elevations on either Maui or the Big Island, bring a small coat and long convertible pants. It can get very cold at the summit of the larger volcanoes! Hurricanes in Hawaii are historically rare events, but the last few seasons have seen increased tropical activity and several tropical storms come close to the islands. If you're visiting during Hurricane Season (June 1 - November 30th in the Central Pacific), then we advise you keep an eye on the tropics prior to your visit. Visitors may want to bookmark the Central Pacific Hurricane Center website for future reference. As is to be expected, when more people are 'on-island' visiting the Hawaiian Islands - accommodation, rental, and flight costs will increase as well. To avoid the crowds and keep rates lower, you can always try visiting during non-peak visitation periods (i.e. ; holidays and summer months are high-demand time periods). When preparing for your trip, the following graphic should help provide a general idea of the average rates during different times of the year. These rates fluctuate by island, but these figures still allow you to prepare accordingly. When planning your trip, there are a few things to keep in mind for each Hawaiian island. 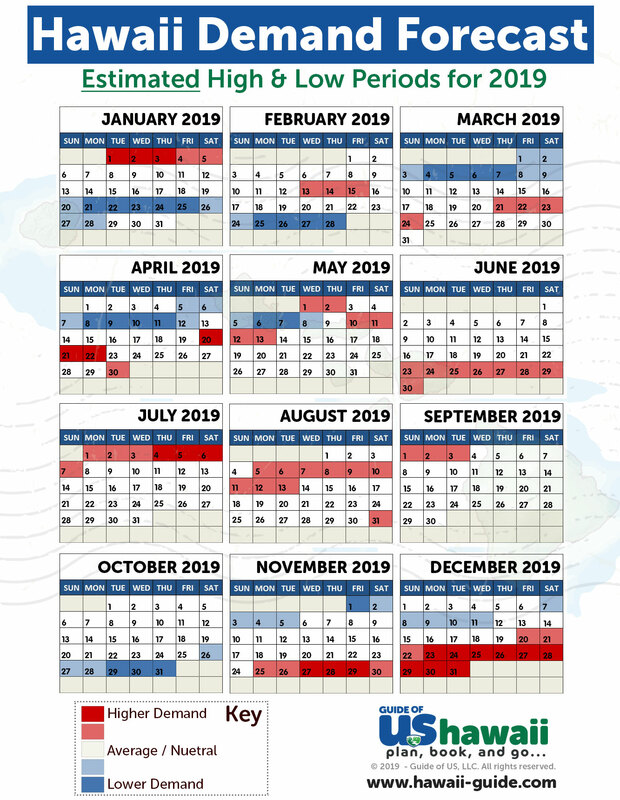 Below we've made note of the most significant events and/or dates that may affect each island during 2019. The weather on Kauai is consistently warm (highs in the mid-70's to mid-80's °F [24-29 °C]) year-round and visitors will enjoy the driest weather on the south shore and western portions of the island. Annual events include the May Day Festival (May) and Eo E Emalani I Alakai Festival (October) and the Chocolate & Coffee Festival (October). For more information, be sure to read our When to Visit Kauai article. The most important thing to make note of on Kauai is that as of January 1, 2019 - much of the north shore remains closed due to the flooding that occurred in the Spring of 2018. Haena Beach Park, including the Kalalau Trail, remains closed to visitors at this time. The county is working to re-open these areas as quickly as possible and hopes to complete work in early 2019. Visitors are encouraged to visit the communities on the north shore that are open - including Princeville and Hanalei. For the latest updates, visitors can check the Kauai County Conditions page. Oahu is a great island to visit any time of the year, but if you especially want to dodge the crowds (on this most populous Hawaiian Island) - then we'd suggest traveling in May or later in the Fall. Both times offer better rates on the island but still have fantastic weather conditions. Also be sure to note that the last week of April is also 'Golden Week' in Japan - which can generate a large influx of Japanese visitors during that period. Other annual events on Oahu that draw international crowds include the Honolulu Marathon (December) and the Hawaii International Film Festival (October). For more information, be sure to read our When to Visit Oahu article. On Oahu, the USS Arizona Memorial remains closed for structural repairs. Visitor access does continue to the Memorial, however; you simply cannot disembark at the memorial at this time. USS Arizona Memorial programs will continue as scheduled and tickets are still required. For more information, including updates on when the USS Arizona Memorial may re-open, can be found on the National Park Service website. The Shangri La is under renovation at the Honolulu Museum of Art. The museum itself is open, but views of the property may remain obstructed at this time. There may also be heavy machinery and additional noise until renovations are completed. 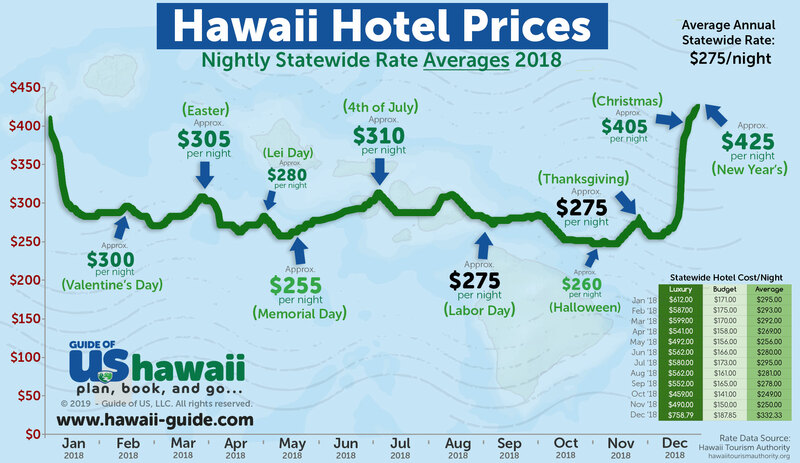 Travelers looking for the best deals on Maui accommodations should seek out travel periods in the spring and fall, as they will be the cheapest months to visit due to decreased demand. As far as events, Whale watching increases visitation starting in November and continues until the spring. Weatherwise, Maui temperatures remain consistently warm with daytime highs in the 75-85 °F [24-29 °C] range during the summer and winter, respectively. If you're heading to the summit of Haleakala, be sure to bundle up accordingly as it gets quite cold atop the volcano. For more information, be sure to read our When to Visit Maui article. Many of you may have seen the news over the Spring & Summer of 2018, about Kilauea volcano on the island of Hawaii and we've included an update on the eruption below. Weather on the Big Island, like the other islands, stays consistently warm year-round. The main thing to note weather-wise is the differences between the Hilo (wetter and cooler eastern windward side) and Kailua-Kona (drier and warmer western leeward side). Annual events that generate an influx of visitors are the Merrie Monarch festival (around Easter Sunday) and the Ironman competition (Kona side, typically in October). For more information, be sure to read our When to Visit the Big Island of Hawaii article. On September 22, 2018 - Hawaii Volcanoes National Park officially reopened to the public and welcomed guests. The Park has resumed its normal business hours and is open 24 hours a day. Parts of the Park remain closed for further assessments and repairs. Information on the current status of Kilauea Volcano can be viewed on the NPS Hawaii Volcanoes website. In summary, as you prepare for your trip - remember to check local calendars for events, review the status of the parks and locations you'd like to visit, prepare and pack the proper travel supplies for the island(s) you're visiting, and make sure not to worry too much about the weather; Hawaii is known as "paradise" for good reason. Ultimately, the Best Time to visit Hawaii is when you choose to go! If you still can't decide exactly when to go, no problem - try our quiz below, and we'll suggest four months we think are best for you. We hope you have a great trip! Aloha! Choosing the best time of year to visit Hawaii is no easy task for most visitors. It can be a confusing and even frustrating job, and that's probably the last thing anyone wants when planning a trip to Hawaii. That’s why we’ve created this quick quiz- to help determine which month(s) of the year are best for you. Based on your personal feedback, we'll suggest the four months we believe would be your best time to visit Hawaii. Read and answer the quick questions below- each of your answers will earn a set number of points which will be tallied at the end. Some questions may seem similar, but try to answer as many of the questions as possible to ensure the most accurate results. Please answer each Question with a "Yes", "No", or "Somewhat" response. This is a really important option for some folks. If you are absolutely set on having optimal weather, then add this to your list. Keep in mind that the windward side of each island will always have a chance of showers, but that in general, some islands and certain seasons are just drier or wetter than others. Select 'Yes' below if you'd like to generally avoid wetter weather, and 'No' or 'Somewhat' if you're not as concerned about rain or wetter conditions. A trip to Hawaii wouldn't be complete for some visitors without a beautiful sunset sail or relaxing dinner cruise. But certain seaons are definitely better than others for the smoothest experience while on the water. Tropical Storms and Hurricanes are historically rare events in the Hawaiian Islands, but over the last few years, this activity has increased during specific months So, if you're looking to avoid visiting during the months where tropical weather may be active, select 'Yes' below. This does not include 'Kona storms' or other spontaneous Tradewind-generated events, only seasonal tropical cyclone activity. If you're a big fan of tropical plants and flowers, then make sure to score this item. Hawaii offers some of the most diverse plants and flora on the planet, and several species are endemic to the islands, meaning they ONLY exist here. Hawaii's tropical climate caters to some flowers blooming almost year-round, but some seasons are definitely better than others. Waterfalls and verdant, lush landscapes are both parts of the remarkable natural beauty that makes up Hawaii's windward coasts. But there are certain seasons where the waterfalls are a lot more scenic than others. If that's especially important to you, ensure you select 'Yes' below. Hawaii's costs and effect on your wallet can vary throughout the year. Generally, for most visitors, we'll assume you're looking to save when it comes to accommodations, food, vehicle rentals, and purchases - but still, have good fun on activities and other experiences. If this is correct, select 'Yes' below and we'll attempt to avoid high-demand months with higher costs. If you're looking for ultimate luxury and don't consider money an option, select 'No' below, and we'll still include those higher-cost months. Otherwise, select 'Somewhat' or skip this question.